Watch Bill Hader and SNL writers talk over the Justin Bieber sketch that they consider to be "the greatest trainwreck ever"
Saturday Night Live films a full dress rehearsal before each show with more sketches than can fit into the time slot. A few skits are inevitably cut, never to see the airwaves again, unless they surface on the Internet. 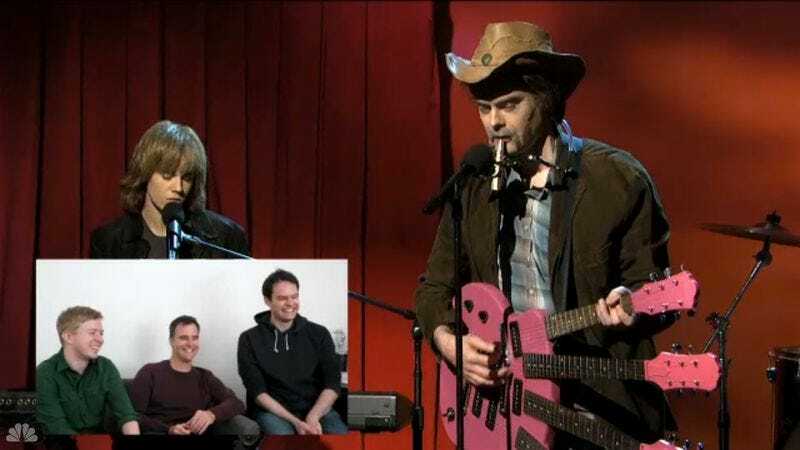 That's what happened with "Song For Daddy," which was written for host Justin Bieber by Bill Hader, Rob Klein, and Jon Solomon, who fully admit that the nixed sketch is an absolute "trainwreck." The original episode aired Feb. 9, but the actual sketch just surfaced online, and it's a doozy. The clip is hilariously painful to watch, with a lot of the absurd humor flying over the audience's (which Hader says was "filled with pre-pubescent girls") heads. At one point, an entire wall almost collapses onto Bieber, and the whole time, a hat casts a shadow over half of Hader's face. Even with all the disasters, though, it still kind of works. Watch below and judge.